Appetizer or side dish? 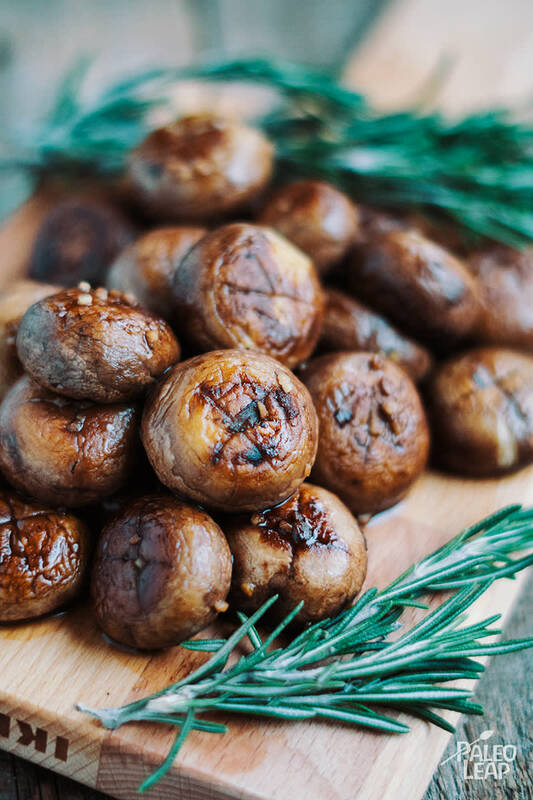 We’ll let you decide, because for us, these roasted crimini mushrooms with rosemary and balsamic vinegar can vanish either way. It’s an amazingly versatile dish too, pairing well with poultry, just as much as beef or pork. Either way, you cannot go wrong in serving it with the favored protein of your choice. And why crimini mushrooms? Well, being that most of the mushrooms we consume are Agaricus bisporus, we use common names to tell them apart. What starts out as a white button or champignon mushroom, turns into a Swiss brown, chestnut, baby bella, brown cap, or crimini mushroom, eventually the whiteness turns into the brown mushroom that we all know and love. Eventually this same white button mushroom turns into a mature portobello, portobella, or portobellini (smaller size). These are all the same mushroom, harvested at different stages of growth. Flavor is slightly different at each stage, try them all! If you can never get enough of the amazing tartness that balsamic vinegar provides to absolutely everything it touches, then you might want to consider a simple stove-top cooking of balsamic chicken drumsticks. Prep this first, and as soon as it is simmering away, you can prepare the mushrooms for the baking sheet – they cook for a similar amount of time, allowing you to create a delicious, raw green salad in the meantime. In less than 45 minutes you will have conquered an entire dinner! The time it takes to eat? Depends on how hungry you, and your guests, are. Add ghee, garlic, and rosemary sprigs to the bottom of an oven-proof skillet. Place the mushrooms, cap side down, on top of the rosemary and garlic. Season the mushrooms to taste with sea salt and freshly ground black pepper. Drizzle with the balsamic vinegar and olive oil and roast in the oven 20 to 25 minutes. Remove the skillet from oven and baste the mushrooms with the sauce that remains in the bottom of the skillet.